What follows is the first LFLO or Leaflow, i.e. Lessons From Loved Ones. This first one will be about my dad. It starts with the actual obituary I wrote for the local newspaper, then moves on to some amusing specifics about how he died, and then some lessons I learned from him. Col, Dr. Monroe Mann, PhD, Esq., Summer 2017, a few months before he died. Colonel Dr. Monroe Mann, PhD, Esq (2/2/1922 – 10/21/2017) died peacefully at the age of 95 in Fort Myers, Florida due to an infection. 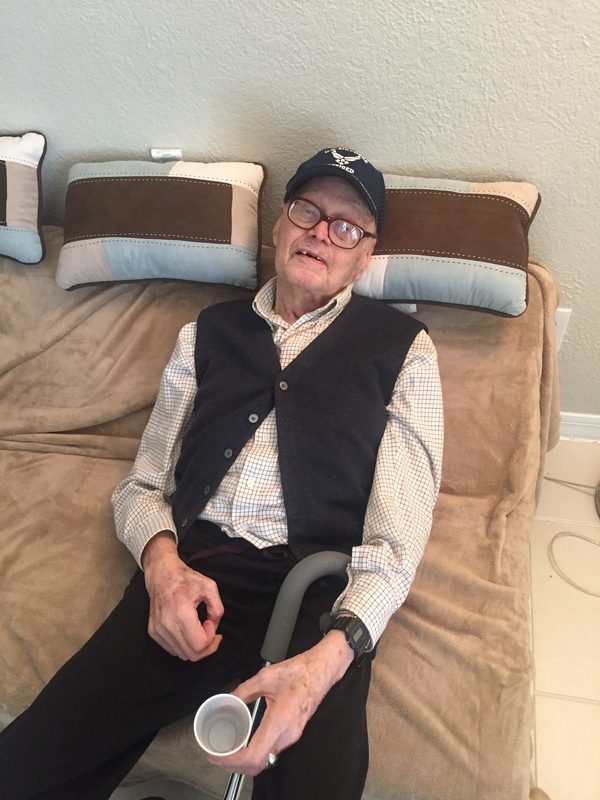 He had been visiting me, his son, in Florida, due to his Alzheimer’s & dementia. My dad was born in Brooklyn, NY but eventually became a lifelong resident of Port Chester, NY, working as an attorney for nearly 65 years after his return from WW2. As those who knew him, he was as stubborn as can be–helpful if he was your attorney, and maddening if you were his opposition. To those who ask me, “Are you Monroe Mann’s son?”, I always respond with a smile, “Is that a good thing or a bad thing?” or “Are you one of the ones who loved him, or hated him?” haha. I was both! 😀 Dad will be cremated this week, and I am working hard now to get him buried in Arlington, a process that could take months. As he was one of the last remaining WW2 veterans to grace our planet, I want to make sure he is remembered for his greatest sacrifice: risking his life for our freedoms that most people take for granted. But throughout my life, I yearned for my dad to tell me that he was proud of me. I thought he would die before I’d ever hear those words, but one day, late last year, I gave him the draft mission statement for a not-for-profit that I was creating to help people succeed in life. It was four paragraphs long, and although incredibly forgetful of who I was many times, he read it, and looked up at me and said “You wrote this?” I was surprised, because his short term memory was terrible. I looked at him and said, “Yes, do you like it?” And then, the words I thought I would never hear: “This is brilliant! I am so proud of you!” It made me so happy. Well, I was able to start that not for profit, and in January of this year, gain tax exempt status for Break Diving, Inc. Since we won’t be having a funeral service for some time, if you would like to pay respects to my father in the meantime, perhaps he would be content if you made a small donation to this charity at www.BreakDiving.org. ; I am posting a longer obituary at www.BreakDiving.blog in a new section called, “Lessons From Loved Ones”, should you wish to read more. Thank you for taking the time to read this. Dad leaves behind a wife, Carolyn, age 69, his son, Monroe Jr., two daughters, Emily & Hilary, and a granddaughter, Bernadette, age 2. Since dad always loved to tell stupid jokes, here’s one that I know he would have wanted me to share with you: “If you’re an American in the kitchen, what are you in the bathroom? (Think about it) European!” I love you dad! ME: Did you go pp? DAD: The toilet is broken. ME: What do you mean it’s broken. DAD: Well, it’s not working. DAD: Yeah, nothing’s coming out. Is there another toilet I can use? This one doesn’t work. We took him to the hospital, he was taken to the rehab nursing home with a catheter, and then four weeks later, he was in the ICU for a urinary tract infection. It got so bad that it affected his lungs, and the only way we could keep his oxygen levels up was with a positive pressure oxygen mask. After discussion with the family, the doctors removed the oxygen mask, gave him morphine for any pain, and he died about 7 minutes later. Here is a video of the last time I saw him. I think it will make you laugh. NICKNAMES: I called him Shrapnel, or Shrap, for what reasons I don’t know. I learned the word in 8th grade I think, when the first gulf war was underway, and I decided that would be my nickname for dad. I also called him Duke, again I don’t know why. And also Papaduke. Paps Domino. And Paps. Tried to cheer me up when Louisa broke up with me by curiously telling me stories of all the girls he broke up with. Didn’t work! When I gave him the draft of the mission statement I created for Break Diving, he asked, “You wrote this?” followed by “This is brilliant! I’m very proud of you!” It was the only time he ever told me was proud of me, and it was something I always yearned to hear. Would always get me out of any parking tickets I got anywhere in Westchester. How he did it, I don’t know and never will know, because I can never do that for my own tickets even as a lawyer! He used to have the photo of the family in Austria when all five us were sitting on the salt mine train. My dad really didn’t ever sit down and have any ‘man to man’ talks with me. My mom was essentially also my dad. So I honestly can’t recall any direct lessons from him. But fortunately, I did learn a lot from him in other ways. BE PATRIOTIC: Be proud of the United States, and its military, and don’t be afraid to join up and do your part to protect our freedom. It’s in no small because of him that I too joined the military. SUPPORT YOUR KIDS: No matter what, support your children financially as much as you can. I didn’t realize how much money it cost to raise me until I was much older, and got a job, and realized that making money to pay bills is really hard. My dad once said on father’s day, “No good ever came of me being a father.” As sad as that was to hear, I have to believe he didn’t mean it, because nevertheless, he did support me, and my sisters. GET A GOOD EDUCATION: It was not my intention to become a lawyer like my dad, and get multiple masters degrees like my dad, and earn a PhD like my dad, and yet… it happened. My formal education has not made me millions, and in fact, has put me into great student loan debt, but… I wouldn’t trade my degrees for anything. NEVER GIVE UP & FIGHT TO THE END: My dad was a legendary trial lawyer. He was a horrible leader (which is why I never took over his law firm, because he didn’t know how to delegate) but… if you had to face off with my dad in a legal battle, odds are you were going to lose, or at least, be so furious and frustrated at the end that you still lost, even though you won. I’m not saying that his legal tactics are something I would want to replicate (I’m way too nice to be the shark he was), but I learned from him to be stubbornly persistent. Fortunately, I also learned when being stubborn is the wrong tactic, as you’ll see below. FIND SOME GOOD HOBBIES: While my dad never really showed me any of his hobbies (inexplicably), he did work on cars, collect stamps and coins, communicate via ham radio, bicycle ride, and whatnot, and I learned from him that it’s good to have fun things to do outside of work. EAT ICE CREAM AND CHOCOLATE: My dad LOVED chocolate and ice cream. Even to the very end. I was in his hospital room in ICU about one week before he died. He was nearly unresponsive. It was hard for him to open his eyes. He had these awkward ‘gloves’ on his hand to keep him from pulling away the tubes and wires. I couldn’t get through to him. I asked the nurse is there was any ice cream. The nurse said yes. I turned to dad and said, “Hey dad, do you want some ice cream?” He nearly jolted upright! “You have ice cream? !” It’s one of my last memories of him, and I’m crying as I write this. A fighter until the end! Particularly when the prize is ice cream! The nurse told me that she would bring him some. I sure hope she did… Either way, whenever I eat ice cream or chocolate now, I am always thinking of dad. DON’T WORRY ABOUT THE FUTURE SO MUCH: I’m 39 now. My dad was 95 when he died. Huge age gap, and he was already older when I was born. About 55 years old. By the time I went off to college, he was in his 70s. I was so worried that he was going to die when I was at Furman, in South Carolina in 1995. He didn’t. I was then worried he was going to do while I was away at American University, in DC, in 1997. He didn’t. Then I was worried he was going to die while I was overseas in Switzerland for two years from 1997 – 1999. He didn’t. By the time I was deployed to Iraq with the Army in 2005, he was now in his mid 80s. I wasn’t so much worried about me dying over there as I was his dying while I was there! Guess what? He didn’t! And then, in 2014 and 2015, I went away to China for more than a year, and once again, I was worried that he would die while I was away. Well, he didn’t. In fact, he didn’t die at all until I was with him down in Florida. I spent the last 5 months of his life actually living with him, and they are some of my best memories of him. For over twenty years, I was constantly worrying that he was going to die. And he didn’t. The lesson I have learned? Stop worrying so much about negative stuff that could happen but hasn’t. So much anxiety wasted. As my friend Arthur Brown told me recently, quoting someone else, “Worrying is a waste of a good imagination.” And that’s what I did. Needlessly. I was right there with him until his very last days. All that worry, for nothing! Thanks for sticking around dad! CAR MAINTENANCE IS IMPORTANT & DON’T DRIVE A JALOPY: My dad was a car guy. And he was always working on his cars, and at the time, he had three Rolls Royces that he was always working on. And yet… the cars he drove, and allowed my mom to drive, were broken down jalopies that always had problems. It seemed so ironic that he had all these beautiful classic cars, but drove around in filthy vehicles, and bought filthy broken down vehicles for my mom, sisters, and I to drive. We didn’t need fancy cars, but a safe one would have been appreciated. Today, I always take my car to the shop to keep it in tip top shape. I never let it fall apart. And I will never let my kids (if I have any one day) drive unsafe vehicles. BE NEAT: I am the exact opposite of my dad in this regard. He was (I hate to say it) a filthy man. He refused to go shopping for new clothes. He would never clean up his own bathroom, so it was always a mess. I learned from watching him to never be like this. No one wants to be around someone who is wearing dirty clothing, and no one wants to use a bathroom that’s a mess. Granted, my mom thinks that I keep any bathroom I use a mess, but even she admits that it’s nothing compared to dad. Haha. Be neat and clean and orderly! Keep things organized. That’s what I learned. STUBBORNNESS CAN GO TOO FAR: As I said above, my dad was stubborn, and in many ways, it worked: it resulted in him winning nearly every law case he was a part of. But… it came with a price. He became angry and vicious because of his stubbornness, refusing to budge. I know I am stubborn too (like father, like son), but I try my best to make sure that I am only stubborn up to a point. I know that being too stubborn and too persistent is just foolish, and you end up with destroyed relationships as a result. I’m glad I learned to be persistent from my dad, but I am grateful I learned not to take it as far as he did. MARRIAGE IS A PARTNERSHIP: If you marry someone, treat them with respect, and as an equal. My mom was never treated as an equal. From the day he married her, he refused to do the things she wanted. He married her on the promise that they’d move out of Port Chester. 45 years later, they were still there. She found amazing investment opportunities at bargain prices in Rye, NY over the years, but he refused to allow her to make any decisions–decisions that are worth millions of dollars today. She had no access to the finances, and even when she won legal cases as a lawyer at the law firm, she saw none of it: she was not allowed to see how much money came in, or where it went. If you want to be single, be single, but if you’re going to enmesh your life with someone else, treat that other person as a partner, not a slave. That’s my mission when I one day find a wife. BUY LIFE INSURANCE FOR YOUR SPOUSE: To be fair, my dad apparently did buy a policy. For $20,000. But $20K? Give me a break. That wasn’t much in the 80s, and it certainly isn’t now. My dad was nearly 30 years older than my mom when they got married. And my mom never worked. Didn’t he know that he was likely to die first? Didn’t he think that it would be really difficult for her to find her way after being married for so long? Apparently not. Some say that buying life insurance is profiting over someone’s death. No, that’s the estate tax. Life insurance is a way to make sure that your loved ones aren’t sent into a financial tail spin panic if you happen to die. Thanks to what my dad didn’t do, I went out and bought a whole life and a term life policy. My mom and niece are the current beneficiaries, and when I get married, I will add my wife (and kids) to the policy as well. It’s not to profit off my death or make someone rich: it’s to make life a little easier for your loved ones in the face of your death. So get life insurance! Yesterday! FORCE YOUR MIDDLE & HIGH SCHOOL AGED KIDS TO GET A JOB: I didn’t have to work in high school, and I wish I had. As a result of not having a job, I didn’t really learn how to use a checkbook until after college. I’m grateful that my dad at the time was making lots of money and I didn’t have to worry about where to find cash to buy food or clothes, but… that shouldn’t have meant that I grew up with zero financial education. Even if I’m rich one day, when I have kids, it doesn’t matter: they are all getting part-time summer jobs, and I will sit down and teach them about money. SPEND TIME WITH YOUR KIDS: Dad did spend time with me, every once in a while, but in my adult years, I discovered that even those rare occasions were orchestrated by my mom. He didn’t really want to spend time with me, but my mom forced him too. So I learned to fish, learned to ride a bike, and built model airplanes together, but… it was my mom who actually made it all happen. The truth is, I don’t have any great memories of ‘spending time with dad’. No baseball games, no trips to the zoo, no memories of him ever taking me out to see a movie. All that was mom. I yearned for that father figure in my life who unfortunately never really materialized. I won’t make the same mistake he did. 🙂 But… having him live with me during the last six months of his life is something I will always cherish. DON’T CONSIDER YOUR KIDS AN INTERRUPTION: At my dad’s office, whenever I would go by as a kid, he was never thrilled to see me. It was usually a waving hand, and a face of exasperation at how I could dare interrupt him. It wasn’t always, but I remember the “Shhh, I’m with a client” more than “Monroe, my son, I am so happy to see you!” Actually, he never said he was happy to see me, haha. But I know at times, he smiled when I came by. Just not enough. And that’s the lesson I learned. TELL YOUR KIDS HOW PROUD YOU ARE OF THEM: I don’t need to repeat myself here. If you have kids, tell them, over and over and over how proud you are of them. It is so easy to feel like a failure in this world. Parents are the first line of defense, but most don’t encourage their children enough. Say it. Often. And then repeat. That’s my plan. FINALLY, PLAN FOR YOUR FINANCIAL FUTURE: And yeah, my dad didn’t plan well in terms of what my mom was going to do after he died. She’s now 69, and isn’t working, and she and I are working together to figure out how to make sure she’s good for the next 30 years. Sure, I’m more than happy to help, but my dad should have taken care of this. He had 45 years to plan for his death, and the support of my mom, and he basically did nothing. It makes me angry, because he could have made preparations in so many different ways, but he didn’t. It’s like he didn’t even consider her at all, and that saddens me greatly, after 45 years of marriage. So I’ve learned to plan for my financial future, and my family’s financial future–long before it even becomes an issue. Otherwise, I’m just being callous, foolhardy, indifferent, and downright stupid. None of the criticisms above in any way take away my love for my dad. He did the best he could with what he had and what he knew. I recognize that he is two generations ahead of me, and I understand that growing up in the great depression probably had a strong impact on him. But I don’t want the world to just remember him for his positive attributes–I want you to know that my dad had his faults too (as we all do) but that I still learned a great deal from him nonetheless. I want this to be a commemoration of my dad, and the many ways he positively influenced my life (even if through indirect lessons of what not to do), because I am still a product of his parenting. I am the man I am today in part because of him, and while I am the farthest thing from perfect, I am certainly a better man for the lessons I learned from my dad, Monroe Mann Sr.
It’s a weird feeling that he’s gone. But writing this is helping me to keep him alive in my heart, and to the world. I hope you found this entertaining and inspiring. If you have a family member who you would too like to commemorate here on the Break Diving blog, in another edition of leaflows, i.e. LFLOs (Lessons From Loved Ones), please join our free community at www.breakdiving.org/community and let us know what you have in mind! We would love to share the lessons from your loved one (at no charge to you) with the world!